Frequently asked questions we get at Modscape often relate to permits – everything from do I need one, to what’s the cost, and how long will it take. Naturally every modular design project is unique so permit requirements can differ, but the following FAQ post will hopefully give you an introduction to planning and building permits when it comes to prefabricated modular homes. Do I need a permit if I’m building a prefabricated modular home? Like a conventional build project, permits are required to build a modular home. Regardless of whether you are building insitu onsite with a slab or constructing a prefab home in a factory and transporting to site, the permit process is very similar. What types of permits are required to build a modular home? There are two main types of permits required for any residential construction project – the Planning Permit and the Building Permit. The two permits vary in state by states but essentially the terms mean the same – one is a legal document issued by your local Council giving permission for development, and the other relates specifically to the carrying out of building construction. Do all projects require a Planning Permit? Not all modular house projects require a Planning Permit. A Planning Permit allows land to be subdivided, developed or used for a particular purpose. Planning Permits are issued by your local Council in accordance with a planning scheme. What is a Development Application and a Complying Development Certificate? In NSW the Planning Permit is known as a Development Application (DA). There is also a fast track approval process applicable to some new build modular projects. Providing the application meets specific criteria it can be determined by a Council or accredited certifier without the need for a full development application. This is known as a Complying Development Certificate (CDC). The requirements for a CDC are a more universal set of requirements, applicable across the state of NSW and, as the title suggests, must be in compliance with specific criteria such as floor size, building heights, site coverage controls and block size. The requirements for a DA will vary between the local councils of NSW. I’m in NSW so which is the best method – DA or CDC? 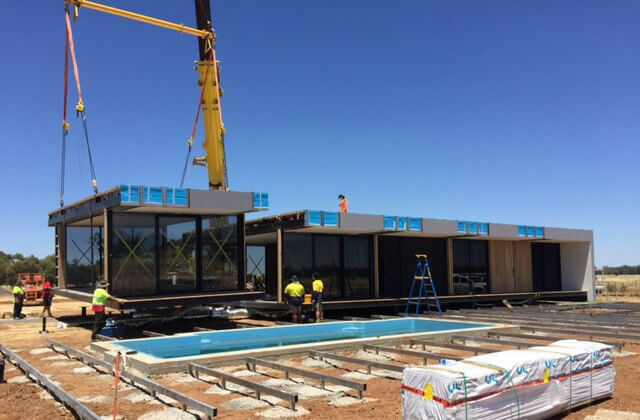 We have a knowledgeable team who will review and assess the factors of your site and will recommend which method is best suited for your new prefab home. How do I check whether I need a Planning Permit for my project? If your site is in Victoria you can go to The Land Channel and search using your address. Free basic property reports are provided and they are usually sufficient to establish whether you’ll need to obtain a Planning Permit. The report stipulates whether there are any overlays present on your site. Examples of possible overlays include Bushfire Management Overlay, Heritage Overlay, Neighbourhood Character Overlay and Significant Landscape Overlay to name a few. Some blocks of land may have more than one overlay in place. If an overlay applies to your site there is an increased likelihood that a Planning Permit will be required. If you are not sure whether you require a Planning Permit for your prefab home, you can always contact the planning department of your local Council. The NSW equivalent is the NSW Planning Portal website. Here you can check which planning controls apply to your property. What is the cost of a Planning Permit? If a Planning Permit is required then there is the cost for Modscape to undertake the documentation for the application. There is also a cost involved in lodging an application with your local council as well as any external consultant costs that may be required to provide supporting documentation. Modscape can assist and undertake the process of obtaining the planning permit and supporting documentation on your behalf. Alternatively you may wish to undertake this process yourself. The cost is highly dependent on the degree of documentation Modscape provides, the reports requested by Council and the external consultants we many need to engage. Typically this costs between $5K-15k. How long does the planning approval process take? Planning approvals generally take 2-3 months from the time you submit an application. Depending on your council they can sometimes take longer. If in NSW and submitting a CDC, the approval process time is typically 2-3 weeks. While this can be seen as a quicker option in getting your new home built, it is a very black-and-white process which may see some compromise in achieving your desired design outcome. In all cases, if the application is unsuccessful, you can appeal the matter to a Civil and Administrative Tribunal (VCAT in Victoria; NCAT in New South Wales.) This process can take several months to reach a resolution. A Building Permit, also known as a Construction Permit, is a document issued by an independent and registered building surveyor. The surveyor assesses the plans and documentation for the proposed building ensuring the design meets the requirements of the Building Code of Australia, The Building Act 1993 and the Building Interim Regulations 2017. Will I require a building permit for a modular prefab home? Regardless of whether you construct a prefabricated home or a traditional site-built home, a Building Permit is always required. The Building Permit provides approval for construction work to commence and is required for most new homes, alterations and extensions. If a Planning Permit is required for your modular house project it must be obtained before a Building Permit can be issued. Do I need a Building Permit if I have a Planning Permit? A Planning Permit does not remove the need to obtain a Building Permit. A Building Permit will always be required when building your new home. We will organise this for you and the cost is included in the contract price. How long does it take for Modscape to arrange a Building Permit? Following the signing of the contract Modscape will arrange for a registered building surveyor to issue the Building Permit. Building Permits are typically issued within two weeks. Once construction is complete do I need any more permits? There is one final permit required once construction is complete. An Occupancy Permit, also known as an Occupation Certificate, will be issued by an independent and registered building surveyor. The Occupancy Permit indicates that the surveyor is satisfied with the works and that your new home is suitable to occupy from a health and safety perspective. For extension projects, a Certificate of Final Inspection will be issued rather than an Occupancy Permit, as the existing building should already have one. Again this is issued by the surveyor. If you have any further questions about the permits required for prefabricated homes, get in touch with our team and we’ll do our best to assist.